Aaron Levie, the 26-year-old founder of enterprise cloud startup Box.net, always has something to say. He’s as witty as he is garrulous, rarely hesitating before catapulting into an answer. He ties his sentences together with an endless string of semicolons, seemingly, with a millisecond pause here or there to cram in reflexive discourse particles–so-yeah-so! or no-but-wait!–as if he speaks with a stutter but without impediment. But when it came to the question “What do you like about Microsoft,” the college dropout was speechless. For Levie, Microsoft is both a competitor and an inspiration, the business equivalent of a mortal enemy’s picture tacked to a dartboard. 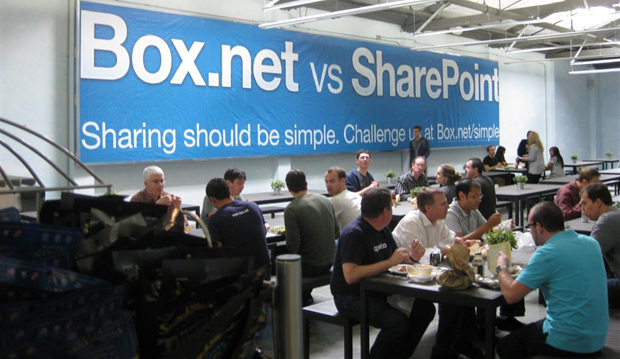 Microsoft is the dominant player in the enterprise cloud space–it’s why Levie has a large banner (see above) hung in Box’s offices challenging his employees to create a simpler alternative to Microsoft’s SharePoint service. Every David needs a Goliath, in other words. Microsoft is his. The startup is gaining on its competitor, though, growing Box’s user base to 7 million, and winning 100,000 business clients, among them such big names as Dell, T-Mobile, and P&G. Today, Box closed its latest funding round of $81 million, bringing its total capital raised to $162 million, with investors that include Salesforce.com and Andreessen-Horowitz. The massive amount of capital will help Box.net scale; Levie wants his products and services to be accessible from any Internet-connected device, whether that’s via Mac or PC, Apple or Android tablet, or BlackBerry smartphone. It’s how Box.net hopes to stay ahead of the competition, even with a much smaller market share when compared to Microsoft. But back to the question at hand: Is there anything he likes about Microsoft? But the point here is clear: Box needs Microsoft as much as it wants to get rid of Microsoft, just as Instagram might target Flickr or Square might target VeriFone, and so forth. On the opposite end, startups certainly act as valuable inspiration for larger competitors. Microsoft needs competition from Box, Dropbox, and Salesforce to keep it from growing stagnant.